On Australia's Great Barrier Reef, There's A Turf Battle Raging : The Two-Way Seaweed might not be as flashy as coral, but it plays an important role on the reef. They compete for space, and rising carbon dioxide levels could someday tip the balance of power. Seaweed? Not so much. But it turns out there are 700 species of algae that grow on coral reefs (compared with about 300 species of coral). And if you ask Guillermo Diaz-Pulido of Griffith University in Brisbane, Australia, seaweed shouldn't just be an afterthought. 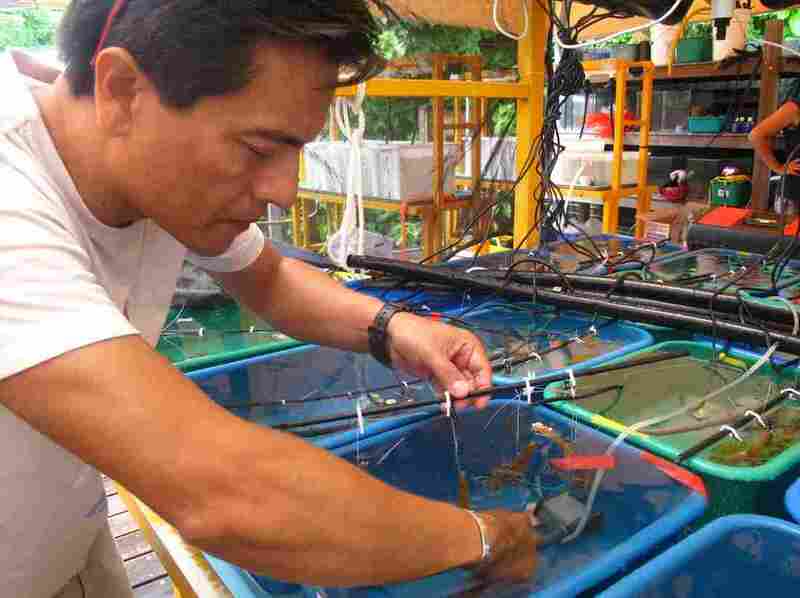 Diaz-Pulido is nurturing tanks full of seaweed clinging to small pieces of coral at the Heron Island Research Station out on the Great Barrier Reef. Sure, some algae look a bit grungy. Some reef seaweed, though, happen to be quite beautiful if you take a moment to appreciate their less flashy charms. And algae turn out to play an important role on the reef. For one thing, algae are always jockeying with coral for space on the reef. When algae win out big-time, they often make the reef look less interesting, compared with the glamorous marine life that draws divers into the water. But algae, being plants, also consume carbon dioxide. The ocean has been absorbing a whole lot of it since we started burning fossil fuels and putting billions of tons of carbon dioxide into the air. So what will happen to algae as carbon dioxide levels race even higher, making the oceans more acidic? Diaz-Pulido is trying to answer that question. Actually, he says, it's not one question, but really 700 questions — one for each species of algae. In general, seaweed seems to be less vulnerable to increasing ocean acidity than coral, which is quite vulnerable. Algae gobble up carbon dioxide during the day, and by so doing, actually reduce the water's acidity in their vicinity. At night, though, algae respire like the rest of us — they take in oxygen and give off carbon dioxide, just as we do when we exhale. And on balance, algae aren't taking in enough carbon dioxide to counteract the effect of all the carbon dioxide we're putting into the air. It's possible that as ocean acidity attacks the corals, algae will prevail in its turf battle on the reef. What does that mean for the entire reef ecosystem? Diaz-Pulido says it's likely to be a lot different from today. But as an algae aficionado and a scientist, he's not passing judgment about the nature of the new ecosystem that could emerge in the coming decades.